19-Year-Old Killed After Girlfriend Crashes Car Into Truck | Schuler, Halvorson, Weisser, Zoeller & Overbeck P.A. A 17-year-old Royal Palm Beach teen was injured when a car in which she and her boyfriend were riding slammed into a truck near the South Florida Fairgrounds, the Palm Beach County Sheriff’s office said. Her boyfriend, a 19-year-old, was a passenger in the car that crashed, sheriff’s report said. “He was an exciting, adventurous, happy person,” his brother said, translating for his mother. 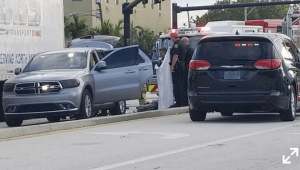 The driver, 17-year-old girl of Royal Palm Beach was injured in the crash, which took place on the 8500 block of Belvedere Road in suburban West Palm Beach, the report said. The 17-year-old was speeding in the 2005 BMW, according to the report. He lost control of the car and it began to spin, then went up on the center median and struck the truck, throwing both people out of the vehicle. The 19-year old boy was dead at the scene. The driver was taken to St. Mary’s Medical Center in West Palm Beach, where the report says she was in serious condition. No update on her status was immediately available. The truck driver didn’t sustain any severe injuries.